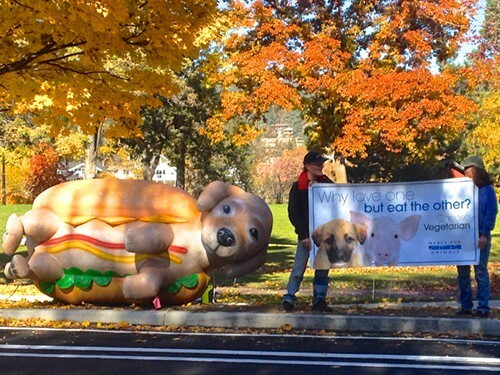 People driving past Drake Park for lunch were greeted by a large inflatable dog and a handful of animal rights activists urging them to fill up on plant-based foods. It's generally considered poor table manners to talk about the unsavory origins of one's food during a meal, but that's precisely why animal rights activists staged their Drake Park protest at a time when Bendites were likely to be on their way to lunch. Members of Mercy for Animals, joined by a handful of local supporters, stood along Riverside Avenue from 11 a.m. to noon today with standard-issue animal rights signage (featuring animals that are either cute and cuddly or covered in blood) and one unconventional prop—a 10-foot inflatable puppy in a hot dog bun. 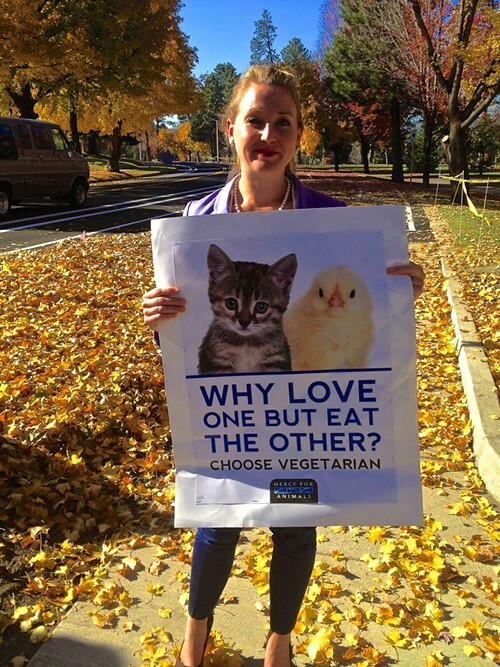 The message: "Why Love One but Eat the Other?" One could argue that franks don't look nearly as adorable in miniature down vests as dachshunds do, but hot dogs (which are possibly one of the most disgusting meat products consumed by humans) do come from actual animals (some of which do look pretty darn cute all dressed up). Mercy for Animals Campaign Coordinator Jeni Haines says that while the organization encourages people to adopt a plant-based diet, it is primarily focused on improving the treatment of farm animals. Originally from the Sacramento area, Haines is currently in the third week of a month-long "cross country tour raising awareness about the treatment of animals in food systems" with the inflatable dog (the dog has been doing this gig for a couple years). Jeni Haines, a campaign coordinator for Mercy for Animals, stopped eating meat at age 10. Though there was no noticeable reaction from passersby in the time that I am there, she says a few people have stopped by and that they were "pretty supportive" of the campaign. "This is definitely an issue that affects all of us," says Haines, who went vegetarian at age 10 and has been a vegan for 6 years. "We deserve to know where our food comes from."